On January 31 2014, two containers arrived from "Help Haiti" in the USA, with supplies for the new sewing school in Fond des Blancs. Two volunteers (Jean Paradis and Corky Terry) worked for a week unpacking the containers and setting up the machines and chairs in the classroom in Digue. They also unpacked fabric and thread. On March 14th, Jean Paradis returned with Kristi Smith. School started on March 17 with the two American and two Haitian teachers and 7 students. Initially, time was spent teaching the use and care of the 12 Janome treadle sewing machines. The students then were taught simple projects so they could learn basic sewing machine techniques (such as a cell phone case, a headband/scarf, a small purse, etc.). 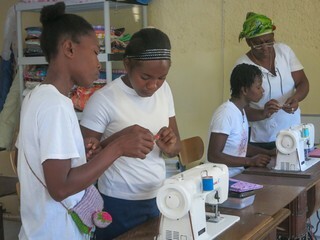 The two Haitian teachers made shirts with machine made buttonholes. Samples of the sewing techniques were hung on the walls for reference. Jean and Kristi returned to the US on March 31. For now, the students will practice sewing techniques, making small items to sell. When they are more proficient, they will practice making shirts, pants, and skirts. The goal of the school is to make uniforms for the elementary school children. This will provide jobs and income for the women of Fond des Blancs.